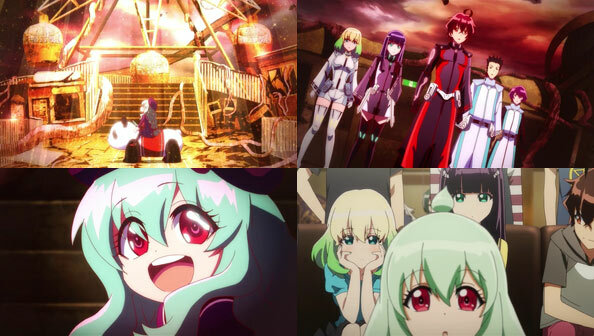 After the life-changing ordeal that was the battle with Yuto, and Rokuro’s gift of new hairpins for Benio, it was as good a time as any for this 50-episode series to have a time jump. 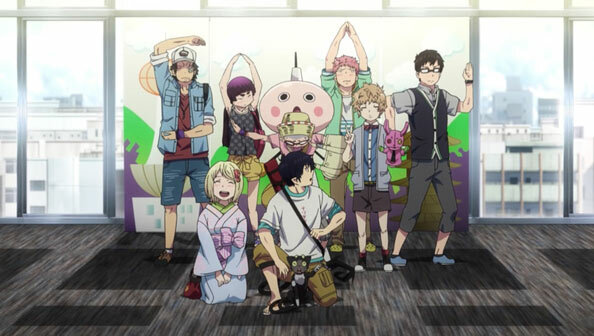 It’s been two years: Mayura is now an exorcist-in-training, donning hot pants and being clumsy; Ryogo and Haruka continue to be a couple, and Roku and Benio are now a reliable and staggeringly effective duo. 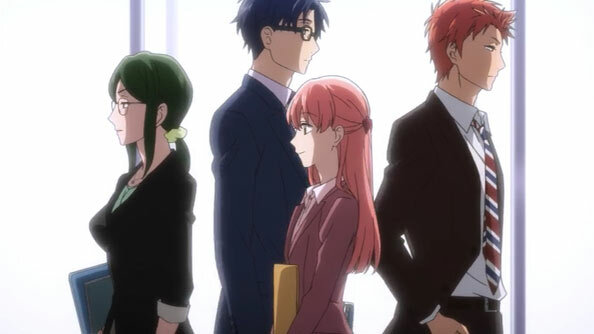 The time jump also means the love triangle is now in high school. Mayura and Benio learn that Rokuro has become pretty cool guy, and it’s nice to see a character who was so flawed and incomplete come more into his own, much like Ushio in Ushio to Tora. Old crushes who rejected him are now smitten, and Mayura wants Benio to piss or get off the pot with regards to acting on whatever feelings she has for the guy. She has, after all, had the advantage of living and working with him for over two years. 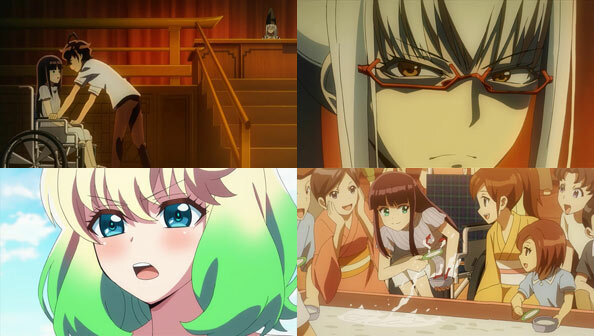 Also good to see Mayura won’t be giving up until the fat lady sings (or the Miko is born). 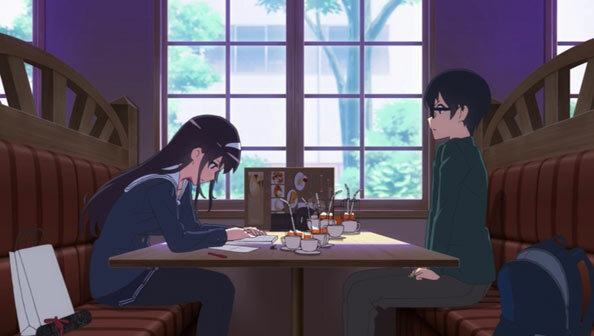 Roku isn’t the only one who’s grown, as Benio is a lot more comfortable at least bringing up the possibility of conceiving a child with Rokuro…’way way way down the road’. Furthermore, she’s open about wanting to cherish the sentiment of that future. The two years they’ve spent together have had a profound effect. This is the kind of long-game gradual development a long show like SnO can bear. There may have just been a two-year shift forwards, but nothing that we see her is out of the blue, but informed by everything that’s come before. Oh, and Han Megumi, so awkward as Five, was born to voice Benio, as her pipes provide a great balance of toughness, forthrightness, and vulnerability. As fate would have it, the couple gets a kid and the opportunity to train as parents far far far earlier than they expected, when after a routine exorcism trip to Magano, the gang finds a tiny young girl in the middle of a ruined playground, surrounded by an ethereal light. 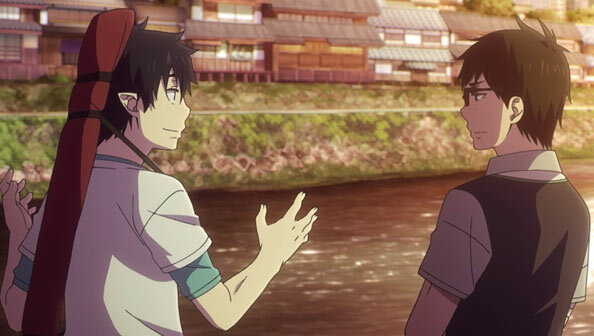 Just like that, we get a little Amaama in our Sousei. The little girl mostly acts like a little girl: mimicking everyone and not giving clear answers. Where she isn’t like an ordinary little girl is her ability to quickly absorb and apply information. Rokuro takes an instant shine to “Sae”, as he deicides to call her when she points to those particular sounds on newspapers. 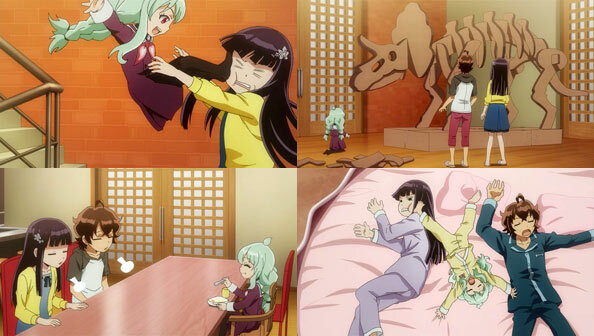 Benio, less so, but she proves a lot better with the kid than she initially gives herself credit for. Considering their personalities, Roku was always going to be better with the kid (as he’s more of a kid himself), but if there’s one person who appreciates Benio’s Ohagi-man, it’s Sae. But yeah, Sae is suspiciously smart, reading whole books, scaling up and building a cardboard dinosaur skeleton, and even picking up a bit of English. She’s also suspicious because of where she came from (Magano), how Seigen looked at her (with a stink-eye), and what’s going on around her (a worsening epidemic of some kind of fog-like infection). The 12 Guardians are also on their guard due to the possibility someone named Kasukami (said with the same dread as “Voldemort”) is gathering Basara to wreak havoc. Is Sae really Kasukami in mini-configuration? Is she a Basara, like Kamui? A very full and enjoyable episode leaves us to ponder these possibilities. A strong start to the next chapter for the Twin Star Exorcists. 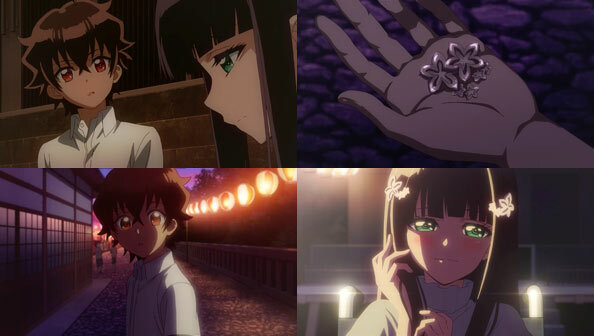 The night before her fight with Ikki, Touka asks Shizuku to ask him to withdraw, a request she never ends up relaying. Touka makes the request out of concern for Ikki’s health after all he’s been through. But even if he doesn’t withdraw, she’s not sure she can be proud of the outcome, since it’s all been fixed by the adults. But she can only control what she can control, which is having a fight she can be proud of, something Uta is sure Ikki wants as well. There may be one-dimensional adversaries in RKC, but Touka is most certainly not one of them, and no matter what the peripheral circumstances, she wants to fight Ikki. It’s nice to see even fleeting doubt in Touka, whom Ikki places on a pedestal as the paragon of self-assuredness and conviction, while he wallows in despair following his father’s quiet but devastating takedown of him. He’s never been lower, not knowing what he can do with his “empty worthless sword.” Never underestimate the power of a father’s candid words to his son. At the main arena, Ikki’s battle with Touka is the Main Event, with a packed house, helicopters circling, and TV cameras rolling. It’s all been arranged, Gladiator style, to maximize Ikki’s humiliation should he be defeated, which Akaza believes is a foregone conclusion, after the “softening up” they did on him…and the fact if Ikki fails to show up in fifteen minutes, he forfeits. But Ikki is on his way, filthy and beaten and exhausted as he is, he still manages to remember his master’s advice: if he’s frustrated about the fact he’s the weakest, hold onto the feeling, since it’s proof he hasn’t given up. He always chose to take those words as the Gospel, and he’s not about to stop now. 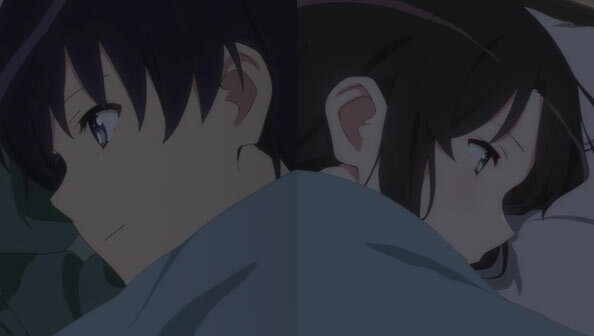 Then he faints, but he wakes up to Shizuku smiling above him. She’s not going to tell him to withdraw from the fight; instead, she’s assembled all of the people rooting for him, who put their dreams in his hands. He’s responsible for taking their defeats and going as far as he can, for the sake of those dreams. Oh yeah, and Stella advanced to Seven Stars, so if Ikki wants to keep his promise, he must, too, even if the odds are extremely against him. The fight itself? It ends surprisingly quickly. 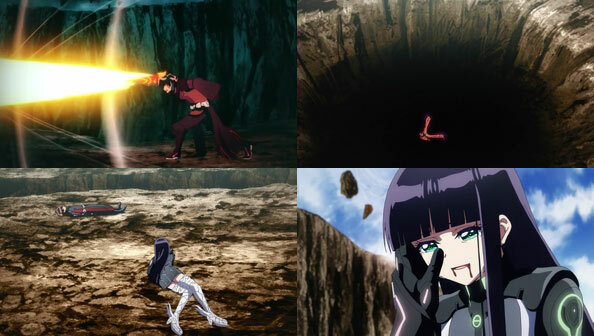 After exchanging their mutual excitement for fighting one another and Ikki vows to “beat her strongest with his strongest”, he casts Itto Shura immediately, but puts everything he has into one swing, while Touka banks everything on her undefeated Raikiri. Like Asterisk, RKC breaks out a special animation style for the singular occasion, but its battle is, as I said, far briefer, but still plenty exciting. Then there’s the traditional long pause before we know who won, but c’mon, we knew Ikki was going to win, right? …Right? Well, that’s what he does, he wins, in front of a crowd of thousands and an audience of millions around the world. Akaza tries one last-ditch attempt to deprive Ikki of what he is due (and, incidentally, his life as well), but Stella closes on him fast, blast him out of the way, and embraces Ikki before he falls. He’s able to stay conscious long enough to publically propose marriage to her in front of those cameras, achieving what he had always dreamed to: present Stella as the one he wishes to share his life and soul with, in front of everyone who matters, along with everyone who doesn’t. The display is enough to move Stella’s father to call Ikki’s, insisting they no longer use their children as pawns in their games. Touka, who looked pretty rough after the fight, recovers along with Ikki, who regains his freedom and the admiration of his school. Touka names him school flag-bearer for Seven Stars, and wishes him well. No bad feelings here; he really did beat her strongest with his. Of course, even after the tournament, there’s still two more years of school, during which time Shizuku promises to teach Stella how to be the ideal Kurogane bride, having already assessed her fitness to join the family and determined Stella a worthy match for her big bro. 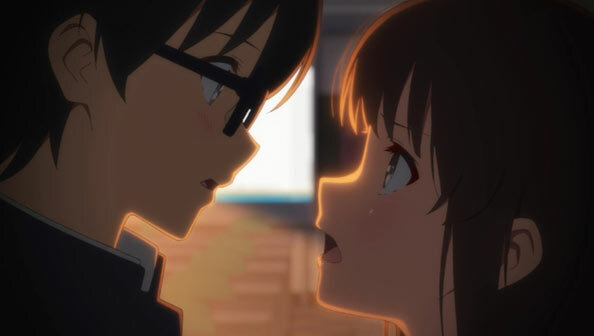 As far as I know, RKC isn’t continuing for a second season like Asterisk, despite the possibilities for further epic battles and romantic progression. 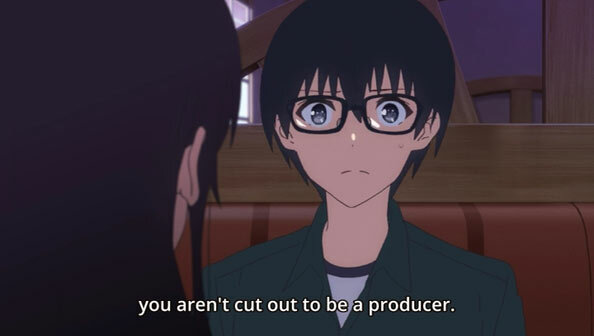 That’s a shame, because I thought RKC was the better show. 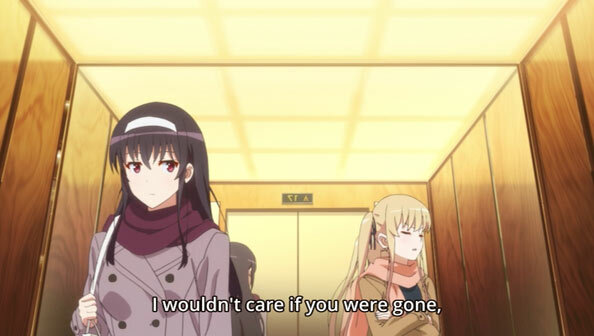 But I’m also not choked up about it, because the show built up the finale well and delivered a solid payoff. It truly reached the greatest heights of chivalry! 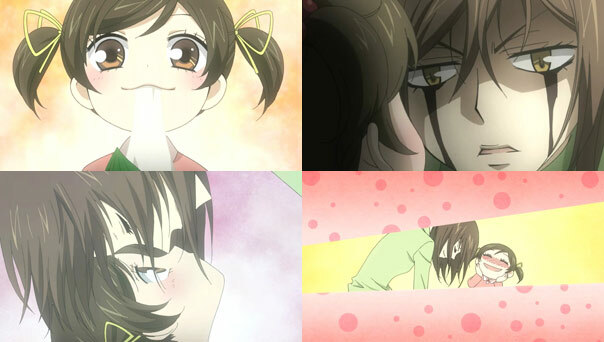 Kami-Haji wastes no time piling on the adorableness in its final episode. Lil’ Nanami is button cute, just the kind of person you want to hold and squeeze and protect for all time. 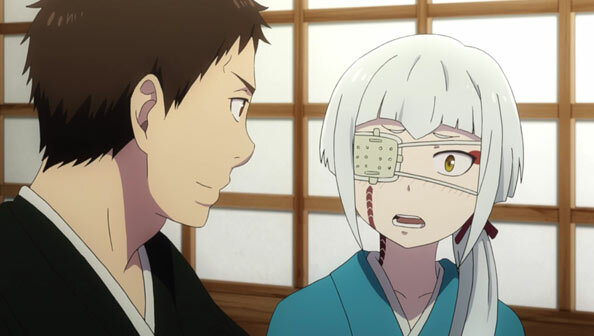 But we learn along with Tomoe that that cuteness is tempered by a steely resolve to look out for herself and be wary of men; advice given by her mother, who herself could not escape a life of bad luck with a crappy excuse for a man. We also learn that the women in her family only ever bear more women, all of them beautiful. 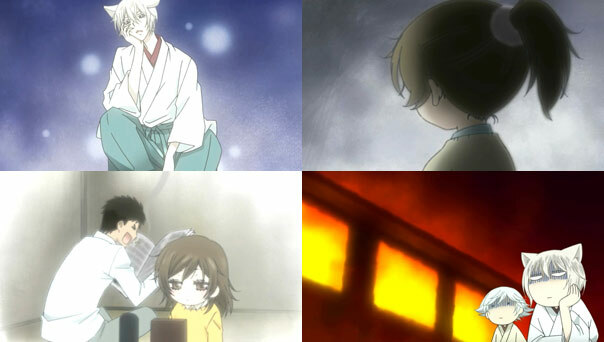 Tomoe is positively transfixed by this educational foray into Nanami’s past, and even though Mizuki tries on numerous occasions to nudge him to put an end to it, Tomoe watches on, even as things go from bad (Nanami’s mother dying, as expected) to worse (Nanami living with her awful dad, who does nothing but goof off and burn their house down). 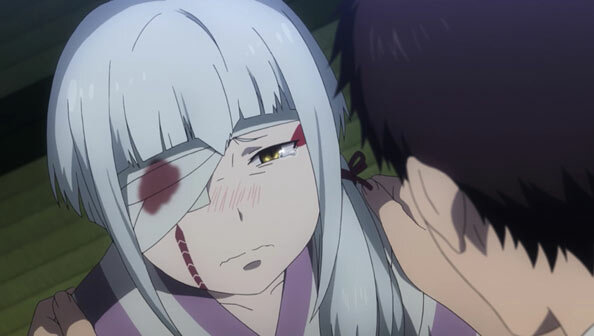 The things that happen to Nanami are almost comically cruel, but for all the slapstick mixed in with the narrative, the episode never makes light of her plight. It also makes it clear these are the experiences that made Nanami the young woman she is today, and that something great and beautiful can come out of all that suffering and hardship. With that, Mizuki again confronts the lil’ Nanami to try to coax her back to the present, and again, she flees from Mizuki, who if we’re honest doesn’t have the most trustworthy aura about him. 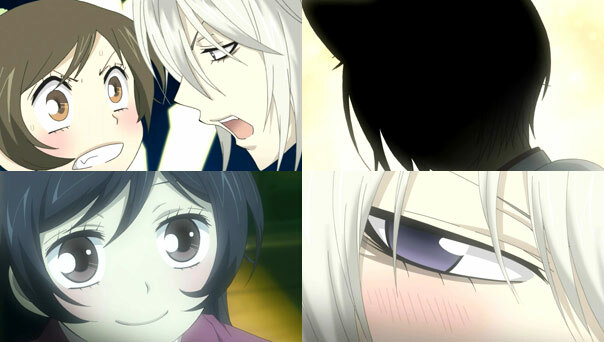 Tomoe is different, though. 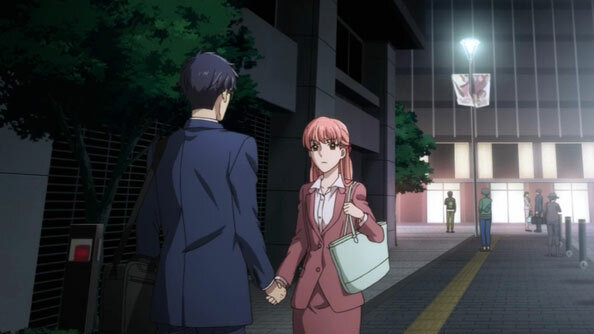 Even though he’s a man, Nanami seems to trust him implicitly. Is it the connection she has with him in the present shining through here, or the connection between her family lineage and the god who granted them beauty at a heavy yet bearable and character-building cost? 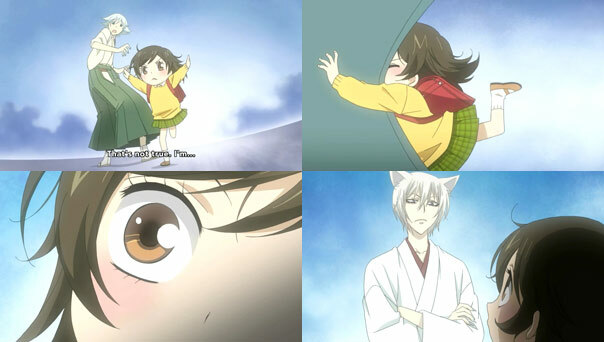 Tomoe isn’t just a fan of lil’ Nanami because she’s adorable. He also likes the fact that everything she desires is clear to him here in her flashback world, as things she concentrates more on appear with more detail and in greater focus. Seeing everything she wants to clearly, and having the power to grant it all, Tomoe’s devotion for her grows. Here, when asked if he truly loves her and is someone she can count on, he can answer directly: yes he does. Heck, he even proposes marriage, and she accepts…but when the grown Nanami wakes up, she’s seemingly forgotten everything about her dream, which deflates Tomoe quite a bit, because he thought he’d actually made progress. He laments the fact that the happy-go-lucky yet delicate girl he was able to confess to so easily was lost in the twelve years since, especially when she’s able to single-handedly convince the zodiac sheep to allow the new year god to shear him. 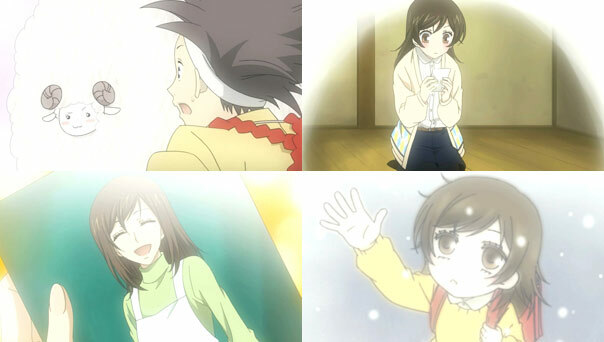 Then Nanami surprises Tomoe again and makes him rethink everything when the Year God furnishes her with a photo of her mother. Now, that wouldn’t seem such an impactful gift, but considering her mother died when Nanami was very young and all photos of her were lost in the fire (a heartbreaking fact), it means multitudes for Nanami to finally see her face clearly. 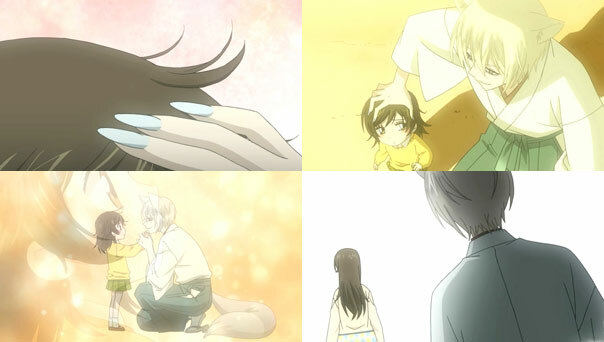 And in doing so, Tomoe sees that neither Lil’ Nanami nor her mother really vanished; they’re still within Nanami. Back at the Shrine, Nanami is back to work on her talismans, and Tomoe is back to work denigrating their poor quality, earning her defiant scowls. But when relaxing after a long day ushering in the new year for worshippers and the like, Nanami settles down for some tea and TV with her shrine family, whom she’s been with now for a year. And so it’s come to pass. She has a family, without having resorted to marriage she’d sworn off. And yet, when asked again, Nanami adds the qualified “probably” to that swearing-off, opening the door for Tomoe, if he wishes to walk through it. 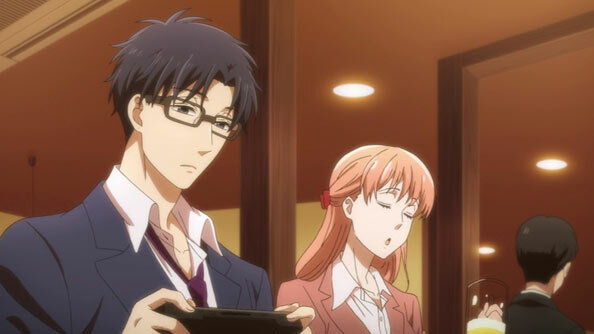 A lot of shows can feel drawn out when they try to take things slowly, but Golden Time can be deft at at delaying gratification and generating interest in unresolved matters. 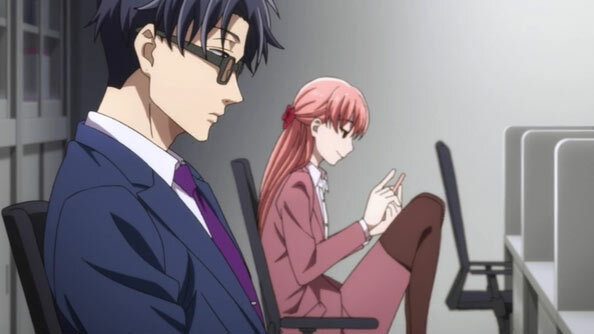 By the end of this episode, Banri is really no closer to giving the ring to Koko, Mitsuo is no closer to reconnecting with Linda, and Oka is no closer to acknowledging Banri’s existence after catching him “having a frank conversation” with Linda. And let’s not forget the overarching unresolved issue: the fact there’s still another Banri rattling around in his head, making it physiologically impossible to move on, as his heard has resolved to do (and had been, to a degree, succeeding.) We’ll confess to Banri’s ring-holding growing more and more excruciating; internally we were yelling “GIVE HER THE RING. GIVE HER THE DAMN RING NOW, PRECIOUS!! !” at the TV at one point. But it just doesn’t happen. There’s a reason we’re so apprehensive. We’re hoping that whatever’s going on in his head could be somehow resolved if he garners the will to present that ring to Koko—knowing Koko could very well interpret it as a proposal. It’s a powerful symbol burning a hole in his pocket. There are no guarantees the ring will do anything of the sort, but the way he and Koko talk, there would be worse things than them tying the knot and sharing the rest of their lives together. But while his big memory problem is left unresolved (and his identity left in a very precarious position after his “relapse” in the middle of the parade), along with all the other things listed above, the episode is still an odd joy to watch. Banri’s journey to find someone to talk about it takes the weirdest turn when Sho and SHi of the Tea Club, of all people, are the first to learn of the ring, and fill his head with a dizzying cocktail of wisdom and conjecture. 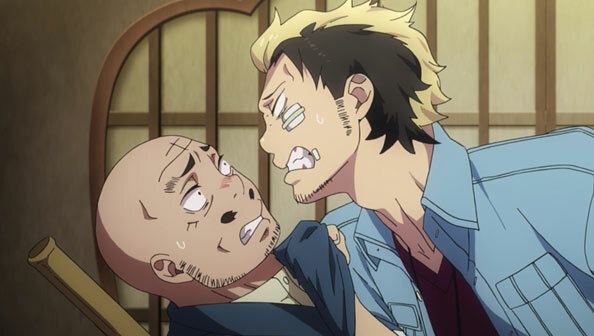 The duo is brimming with zany, aggressive energy; they’re an underutilized gem on Golden Time’s deep bench. It’s as fun as it is frustrating watching Mitsuo struggling so mightily with Linda, and the show isn’t messing around with the obstacles in his path, as he isn’t even able to utter a word to her for the entire episode. It’s also sad when Oka utterly ignores Banri. We love how she often subverts her usual chibi aura with striking displays of seriousness. 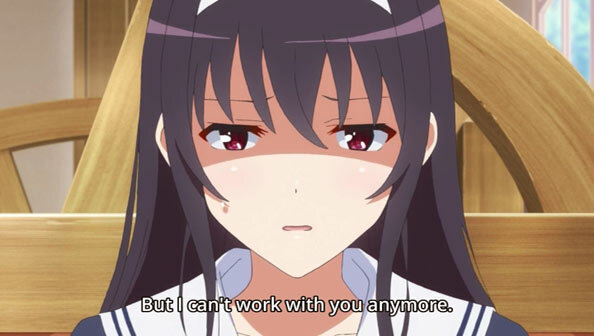 Like Mitsuo, Nana, the Tea Chicks, or even 2D-kun, Oka feels like she carry her own show. And that’s why we thoroughly enjoyed this episode even though it tortured us with the ring and didn’t resolve any of the characters’ many problems: the more time we spend with the supporting cast, the more we want to learn about them, and the more time we want to spend watching them interact and do ordinary, non-supernatural stuff. Golden Time could presumably keep this up for some time, but with only four episodes left (that we know of), we still the show resolves a few things before the end, preferably without leaving us trembling despondently in some dark corner, as poor Banri was. Is Tada Banri really The Worst? Nah, but he’s certainly quite fallible. 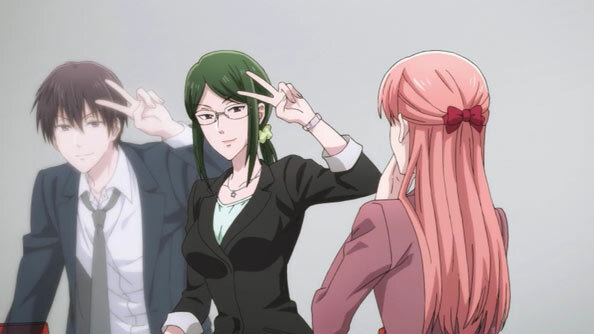 This week he keeps his friendship with Linda a secret from Mitsuo, doesn’t tell Linda that Mitsuo would be at festival club filming, doesn’t even know what Linda is mad about, and later disgusts Chinami, who happens to catch him being all too friendly with the girl Yana-san likes. He even jokes that he doesn’t know who Koko is when she rushes to his arms upon his return to town, and…all right, we’ll admit that was pretty funny. But it wasn’t very nice. So yeah, Banri messed up here and there this week, but one can’t place the blame entirely on him. After all, when you’ve decided not to run form your past anymore, difficulties and missteps come with the territory. Doing what he’s decided to do was never going to be easy, especially he isn’t even sure he can coexist with his past self; it could come back and take over at any time. It’s all to easy to shrink in the midst of existential fears, and thus it’s understandable he’d overlook the affairs and feelings of others now and again. That being said, his actions have consequences. Mitsuo is really into Linda and wants to make a go of it, while Linda is unsure of how to react to his interest in her. 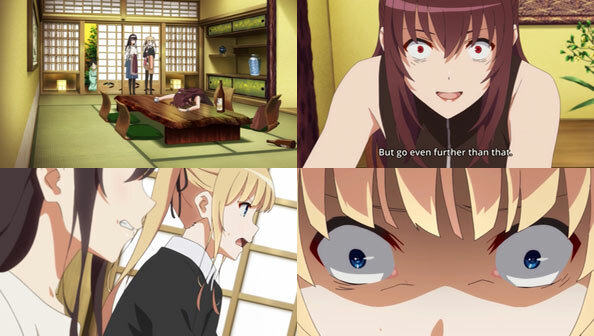 She’s a lot of fun to watch this week, as we get many a hilariously angry-face and scary voice out of her. It’s a little goofy, but her tangled emotions are strongly felt. 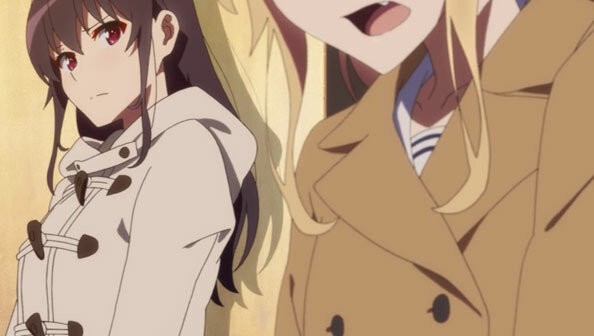 As for Chinami, we’ve never seen her so pissed off, and while it’s true she was being a bit nosy and doesn’t have the whole picture, she’s not wrong that Koko would not have liked the scene of Banri and Linda she witnessed. Linda and Chinami form a tag-team of punishment on Banri, and it’s oddly satisfying to behold. Speaking of Koko—she’s decided it’s time for her and Banru to become one. 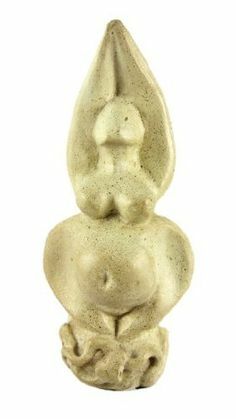 Her gift of the Eiffel Tower sculpture (which beyond its obvious phallusy bears a resemblance to many an ancient fertility statue), and its subsequent role in the failure of her mission (along with her full stomach) are all brilliantly dorky, cute, and very Koko. 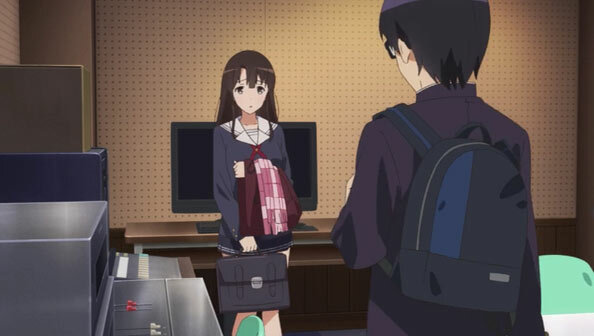 It’s also notable that she presents him with the tower as he’s debating whether to give her his mother’s ring. He tells himself and Koko they have plenty of time, but what’s so agonizing is that we simply don’t know if that’s really the case. When we saw that ring, we immediately considered the possibility that it may never see Koko’s finger. We hope we’re wrong. In any case, Banri can’t be careless with his secrets, his omissions, or his time. This is his golden time.